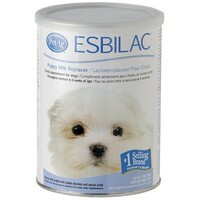 Esbilac Puppy Milk Powder is a complete food source for all puppies that don't have access to their mother's milk, such as orphaned or rejected puppies. Specially formulated to provide all the nutrients, fats, proteins and carbohydrates that the mother's milk does, this highly palatable milk is more than an adequate alternative to the real thing. By supplying the necessary levels of vitamins and minerals, the Esbilac Puppy milk Powder helps to ensure proper growth and development, to ensure your puppy has the best start in life! Also fantastic for post-surgery and convalescent adults that require a high nutritional intake but are unable to feed properly.